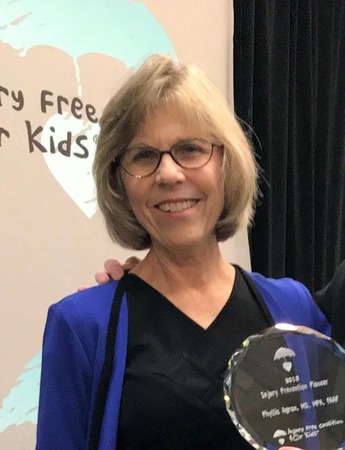 Dr. Phyllis Agran is the 2018 Injury Free Coalition for Kids Pioneer Award recipient. The aware is presented annually to an individual who has demonstrated substantial dedication to the mission of preventing injuries to children and their families. It is designed to honor a person who has been a forerunner in the field of injury prevention, one who is an innovator and a calculated risk taker, blazing trails where there have been none, and one who does not remain silent when needs are not met. As a recognized expert in pediatric gastroenterology, Dr. Phyllis Agran has practiced in the Orange County community for more than 30 years. She is board certified in both general pediatrics and pediatric gastroenterology and nutrition (American Board of Pediatrics). Dr. Agran is a member of the North American Society for Pediatric Gastroenterology, Hepatology and Nutrition, (NASPHGHN). She is professor emeritus at the UC Irvine School of Medicine, department of pediatrics. Dr. Agran has drawn upon her experience to become a leading advocate for policies and programs to prevent pediatric injuries and promote better health and safety outcomes for children locally, statewide, and nationally. Dr. Agran and her husband Larry Agran were instrumental in establishing the first mandatory child passenger safety law in California. On the forefront of research, Dr. Agran began her pediatric gastroenterology practice and conducted research in the field of injury epidemiology and prevention at UC Irvine, School of Medicine. She has received many research grants from the National Center for Injury Prevention, Centers for Disease Control; the National Institute of Medicine, Child Health and Human Development; the US Department of Transportation, National Highway and Traffic Safety Administration; and the State of California, Office of Traffic Safety. Her research studies have been published in the Journal of the American Medical Association, Pediatrics and Accident Analysis and Prevention. Dr. Agran has long been personally and professionally committed to translating research findings into evidence-based guidelines and interventions for preventing injuries. As a respected leader in the field of pediatric gastroenterology, Dr. Agran has served as Medical Director of the Injury and Violence Prevention Program of the Orange County Chapter of the APP. Representing the National American Academy of Pediatrics. Dr. Agran served on the Federal Safe Routes to School Task Force and the National Academy of Sciences Transportation Research Board Committee on School Transportation. She is the State AAP representative on the California School Pupil Transportation Advisory Committee. Dr. Agran is a fellow of the American Academy of Pediatrics (FAAP) and a member of the National American Academy of pediatrics (AAP). She served as the President of the local Orange County Chapter of the American Academy of Pediatrics, CA4, AAP (2009-2011). She has been an advocate for public health policies aimed at reducing trauma and injury to children. She served on the national American Academy of Pediatrics Committee on Injury, Violence, and Poison Prevention, participating in the development and writing of policies. She was chair of the educational arm, the Section on Injury, Violence and Poison Prevention, and now serves on the Violence Prevention Subcommittee with a long-standing interest in bullying.